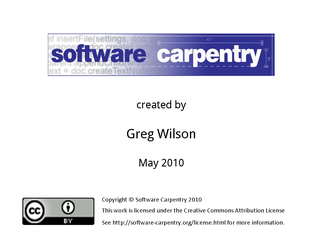 Welcome to the second episode of the Software Carpentry lecture on program design. 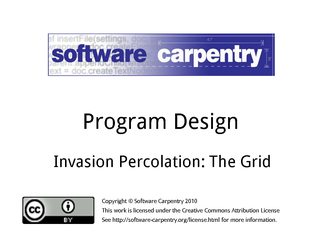 In this episode, we'll take a closer look at how we implement a 2D grid in Python. 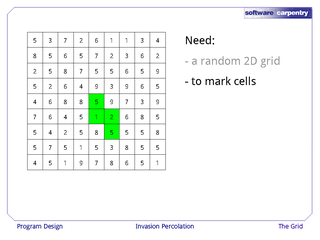 …and we need a way to mark the cells in that grid as being filled with pollutant. 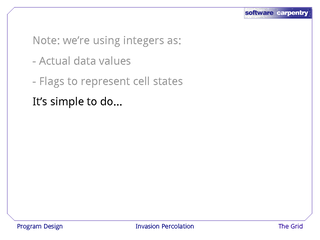 …so we can use any integer that isn't going to appear in the grid otherwise as a marker to show which cells have been filled. In this case, we're going to use -1. 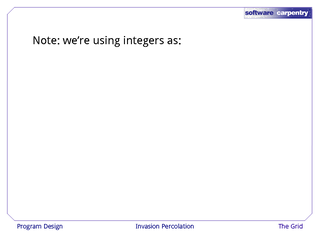 Note that this means we're using integers in two ways. 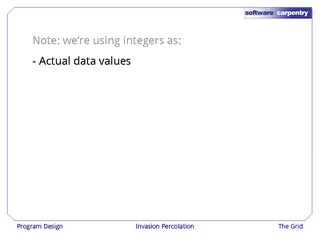 The first is as actual data values. 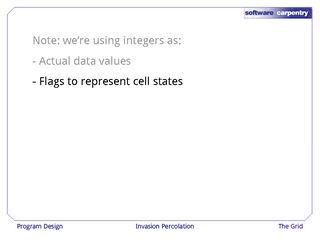 The second is as flags to represent the state of a cell. 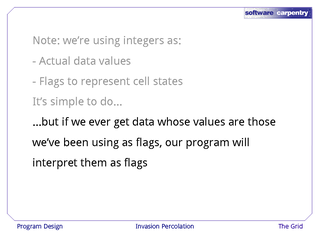 …but if we ever get data who values happen to contain the numbers that we're using to mark filled cells, our program will misinterpret them. Bugs like this can be very hard to track down. 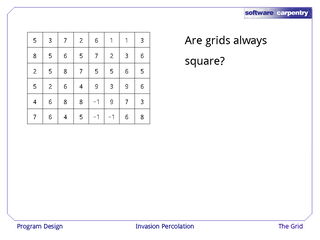 Before we go any further, we also have to make some decisions about the shapes of our grids. 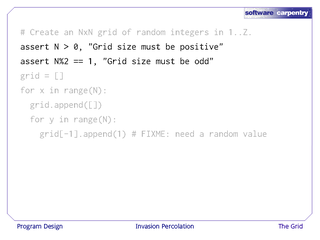 First, do grids always have to be square, i.e., N×N, or can we have rectangular grids like the one shown? 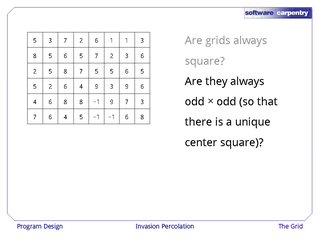 Second, do grids always have to be odd-sized, so that there's a unique center square, or can we have a grid that is even in size along one or both axes? 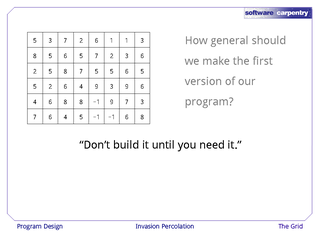 The real question is, how general should we make the first version of this program—indeed, of any program? 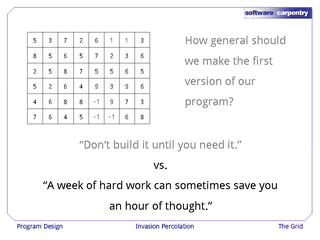 Some people believe, "Don't build it to you need it," i.e., and then worry about tomorrow when it comes. Other people believe that, "A week of hard work can sometimes save you an hour of thought," i.e., a little bit of forward planning—particularly planning for growth and change—can save a lot of re-work and un-work later. …and the only way to get experience is to work through many examples. 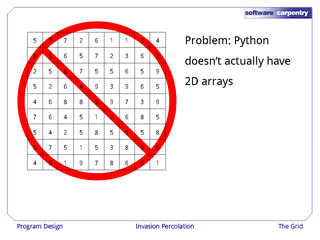 Now, Python doesn't actually have a built-in type for representing two-dimensional arrays. 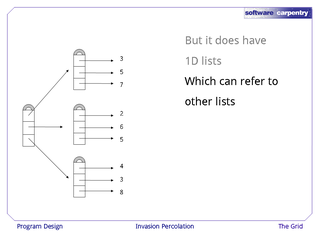 …that can refer to other lists. 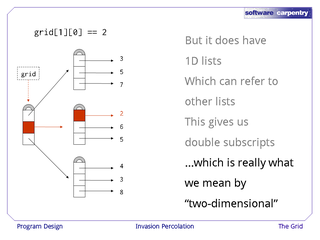 …which is really what we mean by "two dimensional". 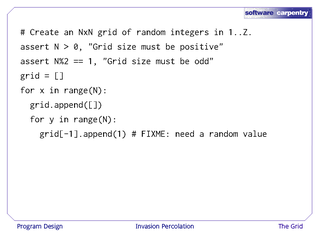 The first thing we do is check that N, the grid size, is a sensible value. 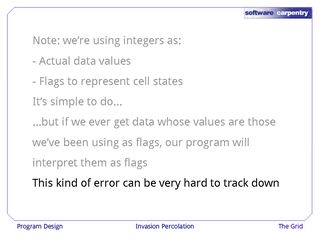 We use assertion statements to do this, so that if anybody ever gives us a strange value for N, our program will fail and print an error message. 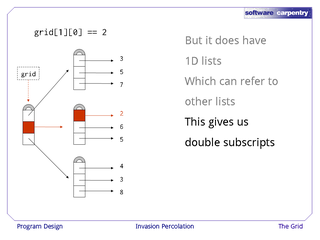 This can save us a lot of debugging later. 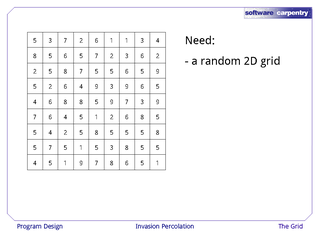 We then assign an empty list to the variable grid. The first time through the outer loop, we insert an empty list into the outer list. 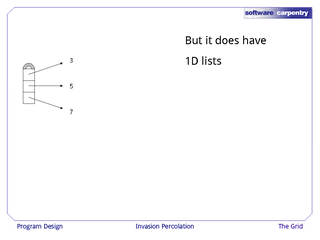 …to that inner list. We'll then go back through the outer loop, append another sub-list, and so on until we get the grid that we wanted.